When Godzilla takes a trip to Europe this happens. The R35 Nissan GT-R may be a decade old, but that doesn’t mean it can no longer hold its own. Quite the contrary, as last year’s refresh proved. But what else can be done to Japan’s ultimate supercar? Is it capable of even more track and road terror? Of course, and UK-based Litchfield Motors has proven this with its souped up GT-R Black Edition, the LM20. Built partially to celebrate Litchfield Motor’s 20th anniversary and because the GT-R is one hell of a machine, the LM20 is limited to just 20 examples, each individually numbered with its own plaque. 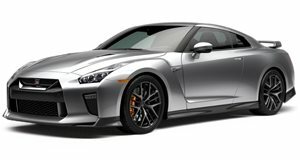 Described as the "ultimate road going GT-R," the LM20 produces a total of 666 hp (exactly the same figure as the McLaren 675LT) and a maximum of 600 lb-ft of torque available at 2,500-5,100 rpm. Zero to 60 mph happens in only 2.5 seconds, 0-100 mph in 5.7 seconds, and top speed is in excess of 200 mph. These performance enhancements were accomplished with ECU recalibrations that also helped improve efficiency. Additional upgrades include an almost completely overhauled chassis, bespoke Bilstein Damptronic suspension, and custom Elbach springs and anti-roll bar. As far exterior enhancements, the front lip spoiler, grille blade and portions of the rear bumper were all created from a material sourced from a F1 supplier. Even the modified rear bumper vents were inspired by the ferocious GT-R Nismo. So, what’s the price tag for all of this goodness? On top of the GT-R itself, you’ll have to fork over 96,995 British pounds. But hey, something like this is both rare and special, and it'll make some stock GT-R owners a bit jealous.